Visit the sacred monasteries of Samding, Tashilumpo and Ganden across the "Roof of the World"
Rejuvenate your spirit with a visit to the home of the Dalai Lama, and explore the spiritual traditions of Buddhism in the Land of the Gods. As you travel from monastery to monastery, you'll be immersed in Tibetan culture, meeting native Tibetans, sampling traditional food and making new friends. Upon arrival you will be escorted to your hotel for time at leisure to acclimate to the altitude. This morning, meander through the Bharkhor District, which encircles Jokhang Temple, the home of Tibetan Buddhism. Continue to the Pabonka Hermitage for an opportunity to witness the Sera Monastery's great Debating Ceremony. 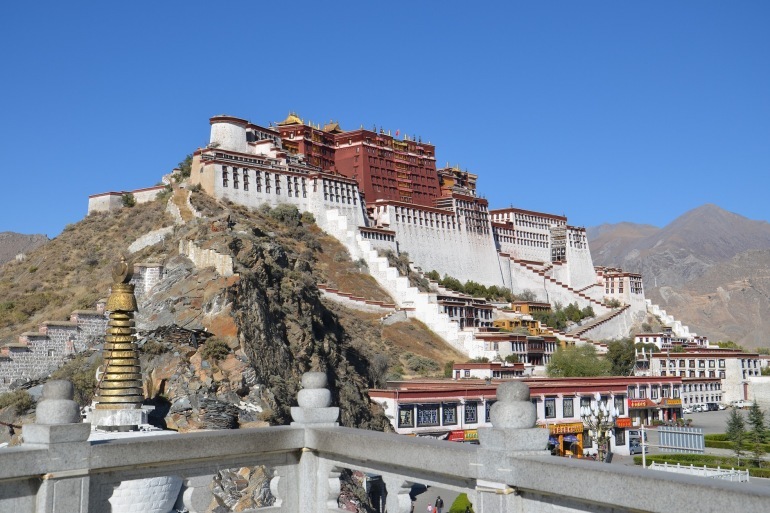 Discover the famed Potala Palace, the former residence of the Dalai Lama. Learn about holistic Tibetan healing traditions at the Tibetan Traditional Medicine Hospital. Head west from Lhasa into the stunning Tibetan countryside past towering mountains, rushing rivers, charming villages and fluttering prayer flags on the way to Kamba-la Pass. Take in the stunning views over the turquoise-colored Lake Yamdrok as you continue to Samding Monastery en route to Gyantse. Tonight, walk through the traditional Tibetan part of town. Visit the mighty Gyantse Kumbun and Pelkor Chode monasteries as you depart for Shigatse. Explore charming villages on the way and practice your Tibetan with the local children before arriving at Tashilumpo Monastery, the home of the Panchen Lama. Return to Lhasa along the Friendship Highway and visit Norbulingka, the former Summer Palace of the Dalai Lama. Delve into Tibetan Buddhism at the Ganden Monastery, the spiritual home of the Gelugpa Sect. Explore a traditional village and learn more about Tibetan culture and cuisine with lunch at a local restaurant. Bid farewell to Tibet as you are escorted to the Lhasa airport for your onward flight.